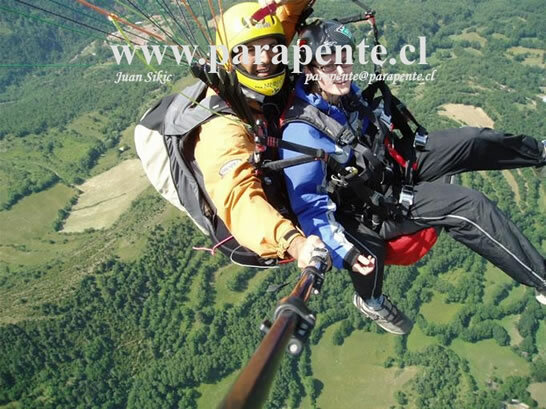 If you wish to feel an unforgettable sensation, fly "Paragliding (Tandem)" accompanied by an instructor. 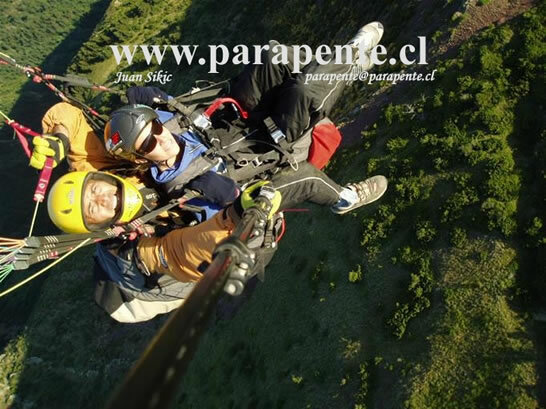 With the tourism "Tandem" Paragliding Flight, The Pilot and passanger fly together. The passenger does not require previous knowledge about paragliding; he or she must only relax and enjoy this marvelous experience. The pilot take off, flies, and lands the paraglide with total control and safety. Under certain flying condition and the pilot´s discretion, the passanger may control and pilot the flight under direct supervision of the pilot. Pro Pilot has been operating tourism flights for ten years and during this time has won an unsurpassable reputation in tandem flights. (tourism flights). This reputation has been due to constant hard work and dedication of our experienced professional pilots. Our team of pilots are not only highly experienced tandem, but also recognized instructors under the Free flight Chilean Association (A.Ch.V.L). Also, the pilots are licensed by Federation Aeronautique internationale (F.A.I) and the air federation of Chile (FEDACHI) and air sport of the federation Aragonesa (F.A.D.A). Pirámide o Batuco Flight time at 15 to 20 minutes. Value of € 70. Mountain Flights time 20 to 30 min +-1400ASL/ AGL . Value of € 90. Edited video of the flight Value of €30. We recomend carried a trecking boots, jeans and coat.